Expanded Perlite can be used to control and clean up liquid spills. The Perlite may also be used to provide rapid deodorizing and dehydration of animal waste liquids. 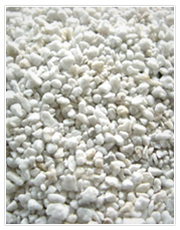 In these applications, the Perlite may be used in granular form or compressed into pellets of the desired size and shape. Perlite also is suggested as an adsorbent media in enclosed containers for the disposal of liquid toxic waste substances. By activating the expanded Perlite with hydrochloric acid and/or sulfuric acid the material can be used as a purifying agent for waste and process waters. Expanded Perlite is recommended as a carrier for pesticides, feed concentrates, herbicides, and other similar applications. As a carrier for feed concentrates, Perlite will readily adsorb the concentrate while remaining free flowing (anti caking), and chemically resistant to microbiological degradation. The Perlite also permits quick liquid movement between the carrier surface and the recipient of the feed concentrate. Nordisk Perlite ApS has developed an absorption product with a combination of Perlite and Bentonite with new and special properties. I can be used as lightweight cat liter.